Rose Ausländer (May 11, 1901 - January 3, 1988), maiden name Rosalie Beatrice Scherzer, was a German writer. She was born in Czernowitz, which at that time was part of the Austro-Hungarian Empire. Between 1907 and 1919, she received her primary and secondary education in Vienna and Czernowitz. In 1919, she began studying literature and philosophy in Czernowitz. She developed at this time a life-long devotion to the philosopher Constantin Brunner. After her father died in 1920, she gave up her studies. In 1921, together with her friend and future husband Ignaz Ausländer, she left Bukovinna, and migrated to the United States. Here, she worked as an editor for the newspaper "Westlicher Herold, and she began writing poems. In 1927, her first poems were published in the Amerika-Herold-Kalender, which she edited. On October 19, 1923 she married Ausländer in New York. A mere three years later, they were divorced, presumably because of a boring family life. In the same year, she became an American citizen. In 1927, she returned home for eight months to take care of her sick mother. In 1931, she returned home again for the same reason; there she met graphololist Helios Hecht, with whom she lived until 1936. Because she hadn't been in America for more than three years, she meanwhile lost her American citizenship. After breaking up with Hecht, she left Czernowitz for Bucharest in 1936. In 1939, her first volume of poems, Der Regenbogen (The Rainbow) was published after intermediation of Alfred Margul-Sperber. Even though it was a success with the critics, it was not accepted by the public. The greater part of the print run was destroyed by command of the Nazis in 1941, after they had occupied the city. As a Jew, she had to move into the ghetto of Czernowitz. She remained there two years, plus another year in hiding so as not to be deported to the camps. In the ghetto, she got to know Paul Celan, under whose influence she modernised her style, leaving behind her classic-expressionist tone. In spring 1944, the city was liberated by the Red Army. She left the country again, returning to New York, where she again was given American citizenship in 1948. She was able to meet Celan only once more, in 1957 in Paris. 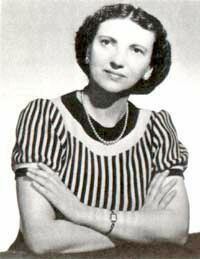 After the trauma of persecution, she began writing in English and only in 1956 did she resume writing texts in German. When she published her second volume of poems, Blinder Sommer (Blind summer), in 1965, it was welcomed enthusiastically by the public. In 1967, she returned to West Germany. From then on, she lived in Düsseldorf; she was bedridden from 1978 due to arthritis. She had to dictate her texts, as she was not able to write by herself. She died in Düsseldorf in 1988. The text on this page has been adapted from the Wikipedia web page for Rose Ausländer and can be found here.